We've been combing through court records, with certain limitations. We looked at lawsuits and bankruptcies since the shows started airing ... and all divorces, regardless of date. - DIVORCES: The ladies of "Real Housewives of Orange County" took top honors with 12. - LAWSUITS: It's a tie!!! The casts of "Real Housewives of Atlanta" and "Real Housewives of New Jersey" each have a total of 8. 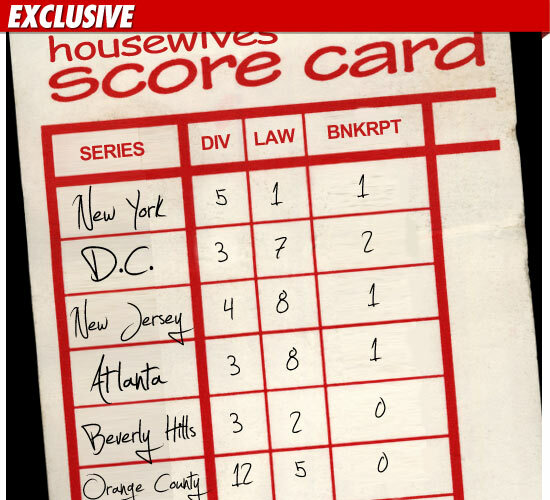 - BANKRUPTCIES: "Real Housewives of D.C." won with 2. As for the losers, we know ... it's an honor just to be nominated.